Dr. MC Gupta, a doctor turned lawyer, guides with practical answers and insights for queries posted by Indian doctors. Here he answers one such query related to patient consent. What is the difference between real consent and informed consent? 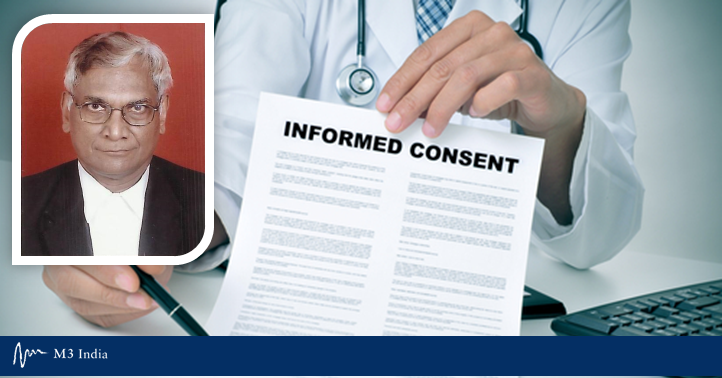 C— The concept of informed consent, while retaining the basic requirements consent, shifts the emphasis to the doctor's duty to disclose the necessary information to the patient to secure his consent. "Consent that is given by a person after receipt of the following information : the nature and purpose of the proposed procedure or treatment; the expected outcome and the likelihood of success; the risks; the alternatives to the procedure and supporting information regarding those alternatives; and the effect of no treatment or procedure, including the effect on the prognosis and the material risks associated with no treatment. Also included are instructions concerning what should be done if the procedure turns out to be harmful or unsuccessful." d) The effect of no treatment or procedure, including the effect on the prognosis and the material risks associated with no treatment.